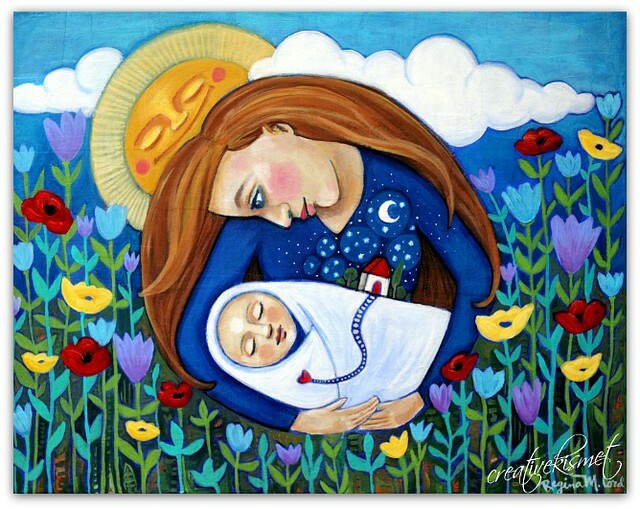 I painted this precious mom and baby painting a couple of weeks ago. I had sketched out the idea for it a really long time ago and finally felt the need to paint it. I have prints, cards and art blocks available in my shop. I added other stuff too. Like, new original art, a couple of ornaments and new art blocks. I hope you will wonder over and check it out. There is a new sale section too! Just finished up the last of the art shows for this season and am planning a busy summer of new creations to get ready for the fall. And….. I am in the process of planning out a new e-course. It’ll be portrait painting of course. Newer stuff though. But first, I have surgery tomorrow to remove my pesky little appendix. It is outpatient and I should be home by tomorrow evening! What a deeply symbolic picture, which really resonates with me. Everything is so well chosen and is poignant with meaning. Such a well composed and constructed picture, it’s lovely. Best of luck for your surgery! I love this picture! And best wishes for an uneventful surgery and speedy recovery!